Two threads have run consistently throughout this history; cooperation and progress. Working with biological material, and the associated operations and environments, is so full of complexities and entwinement’s that complete success in one’s endeavors requires both interdepartmental and intradepartmental cooperation. Such has been one of the highlights of our background. Progress to better serve mankind was always an overriding goal. In particular, progress was achieved by superior minds, recruited from all facets, levels and areas of our professional arena. They were given the freedom to think and to apply themselves to their full capability—and of course to be rewarded accordingly. Consistent with our continual challenge to help improve the physical biological systems, the department’s name was changed in 1965 to Biological and Agricultural Engineering. The art and the science of understanding, developing and applying engineering principles to biological material through its complete cycle from growth to preservation and the utilization and/or conservation is the uniqueness of our profession and distinguishes it from other engineering professions. We need to be ever cognizant of the fact that the biological plant is today still the world’s best collector of the sun’s limitless energy. The name Biological and Agricultural Engineering befits this uniqueness. More and more other departments and agencies are coming for cooperative research work. The department is recognized by many as having one of the ablest of faculty and staff, and the finest of equipment and facilities anywhere in the world. 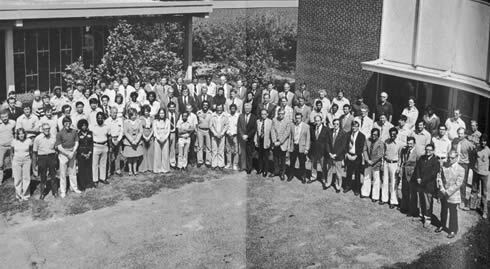 One indication is that the annual meeting of the American Society of Agricultural Engineers was held here in June 1977—the first time in North Carolina. In numbers the students, staff and faculty have grown over the years. There are now 43 faculty members in the department of which 4 are USDA Cooperators. The staff numbers 37 with 3 holding USDA appointments. They are shown as a group in Figure 39. We are proud of the excellent cooperation with USDA, which provides further strength and interdisciplinary inputs for a more comprehensive approach to problem solutions and graduate instruction. One might say that only the foundation was laid during these first 60 some years. We — concerned citizens, faculty, staff, and students — built that foundation together. In the next century lie the more difficult challenges, the opportunities and the responsibilities for the engineers to do their part in providing man’s most basic requirement, food and fiber. It appears to be a formidable task indeed, particularly when viewed from the growing shortage of fossil energies and necessary interaction and evolvement in the interaction and evolvement in the international field.